Featuring spectacular views of the skyscrapers and bridges of New York City, this hotel is located in the Lower East Side neighborhood of Manhattan. Amazing Hotel , True New York old fashion vibe but with a rock twist! Great location in Lower East Side. Highly Recommended. This hotel features New York harbor and Statue of Liberty views, a 24-hour fitness center, a spa and restaurant. We loved everything at The Wagner, especially the excellency of the staff. Featuring Baccarat crystals in every room, the Baccarat Hotel and Residences is located in New York. Very accommodating with check-in and check-out times. Beautiful, elegant, well-appointed rooms. Featuring an open-air Moroccan-tiled courtyard, this 14 room boutique hotel is located in Manhattan's SoHo neighborhood. Free WiFi access is available. The Penthouse is amazing and the only way to go if you want to make this an extra special stay. Located within 2 minutes’ walk of Bryant Park and Grand Central Terminal, this boutique Midtown hotel offers Wi-Fi, a library and an evening reception with wine and cheese. Friendly Helpful staff:I asked to receive packages from Amazon,they received and keep. 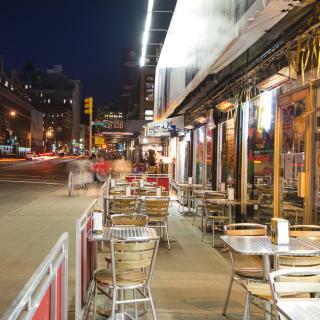 Located in Lower East Side in Manhattan, guests at the Orchard Street Hotel will find many restaurants and shopping destinations in close proximity. Brand new hotel, excellent value for the money (for Manhattan, of course). The Carnegie Hotel in midtown Manhattan is a modern intimate boutique hotel, designed with fine architecture and custom Italian furniture. Fresh renovation, good service and excellent cleanness! Offering a restaurant and a fitness center, 1 Hotel Central Park is located in New York. Each room here will provide you with air conditioning and a seating area. Extremely clean and beautiful interior design. Centrally in Midtown Manhattan on Fifth Avenue, this hotel is across from the Grand Army Plaza and Central Park's main entrance. It features on-site dining and free Wi-Fi. Everything is perfect. And all the staffs are friendly. 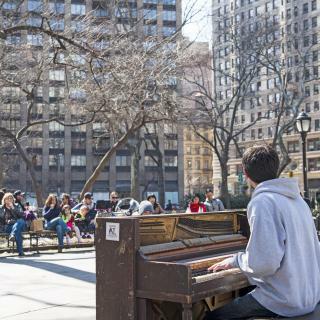 Which neighborhood is the best one to stay at in New York? Manhattan, Harlem, and Lower Manhattan are popular with other travelers visiting New York. Many families visiting New York loved staying at The Whitby Hotel, Baccarat Hotel and Residences New York, and Hotel Giraffe by Library Hotel Collection. Which hotels in New York have nice views? citizenM New York Bowery, Hotel 50 Bowery, and The Bowery Hotel got great room view-related reviews from travelers in New York. Which hotels in New York offer an especially good breakfast? For hotels in New York that serve highly-rated breakfasts, try The Sherry Netherland, The Broome, and Crosby Street Hotel. On average, 3-star hotels in New York cost $190 per night, and 4-star hotels in New York are $267 per night. If you're looking for something really special, a 5-star hotel in New York can be found for $491 per night, on average (based on Booking.com prices). 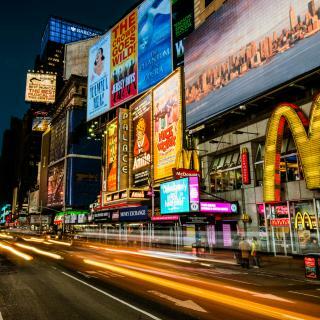 On average, it costs $146 per night to book a 3-star hotel in New York for tonight. You'll pay around $207 if you choose to stay in a 4-star hotel tonight, while a 5-star hotel in New York will cost around $449, on average (based on Booking.com prices). Which hotels in New York are good for couples? These hotels in New York are highly rated by couples: Casablanca Hotel by Library Hotel Collection, The Greenwich Hotel, and The Whitby Hotel. Travelers who stayed in New York near John F. Kennedy International Airport (JFK) have said good things about Best Western JFK Airport, Days Inn by Wyndham Jamaica / JFK Airport, and Holiday Inn Express Kennedy Airport. Which hotels are the best ones to stay at in New York? The Beekman, a Thompson Hotel, citizenM New York Times Square, and LUMA Hotel - Times Square are some of the popular hotels in New York. The average price per night for a 3-star hotel in New York this weekend is $326 or, for a 4-star hotel, $440. Looking for something even fancier? 5-star hotels in New York for this weekend cost around $833 per night, on average (based on Booking.com prices). The amazing New York City is full of iconic architectural landmarks, cultural venues and stunning views. So why not explore the Big Apple to its core with a Broadway show, a game at Yankee Stadium or a ferry ride to the Statue of Liberty? 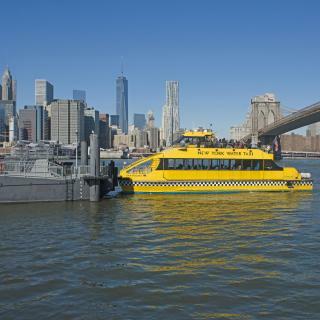 Whether you want to see chic Manhattan, culturally diverse Brooklyn or the birthplace of hip hop in the Bronx, you can count on city’s reliable subway or iconic yellow cabs that will take you there in no time. Don’t forget to visit the top of the Empire State building and admire the great city panorama and iconic skyline. New York’s John F. Kennedy and LaGuardia airports make travelling to downtown easy and taking a train into Grand Central Station is yet another sight to see. From budget hostels, to trendy apartments, to top-notch luxury hotels, Booking.com offers a variety of accommodations so you will always find the best solution for your New York trip. The cost of NYC is why I will never take my family back. The cost of NYC is why I will never take my family back. It is not a place for a family of five to stay even for a short time unless you are willing to pitch out major money for things like food, and also good sized hotel rooms for everyone to have a place to sleep. It is a culture shock for sure, if you go in the winter, wear layers, if you go in the summer definitely don't, the weather is intense at times, don't underestimate it. Uber works fabulous for the city, super cheap and if you use it right you can get a great deal of free rides. Some places I would recommend... Chelsea Market if you like something more off the beat, The Grand Slam in Times Square if you are looking for some insanely cheap tourist items, and the garment district if you enjoy driving past some beautiful windows filled with handmade dresses, and bulk supplies of fabric, beads, etc. Bryant Park from late October on is filled with beautiful glass houses that are all lit at night and you can find some awesome vendors unique in every different craft. Some good food places here are Pickle Me Pete's and Oops. I love NY, I have been coming once a year since graduation from college. There is always something new to do and every time I go I stay longer and spend less. Learn from the locals and get a Metro cards, if I did nothing else I wore good walking shoes and I loaded up my Metro Card. Enjoy your time here, the city that never sleeps and neither will you since you want to do everything and most things are open LATE. You have to try the Dessert Bar-Spot. They have many locations. I never ate out of a planters pot before, but I liked it! I love the Village, Harlem and Broadway. I love to walk and see the sites and you have to go to the museum. There is so much rich architecture and history here, there is never a dull day in NYC. A great activity for a solo travel was participating in the hostel tours for $10 and good walking shoes I saw the city with a local tour guide and on another day a world renowned tour guide. I would have paid $50-100 easy for each tours and been okay with it for what I got for $10 each! NYC Hostel is the best place to stay, get a nice breakfast, clean bunk, fresh sheets and towels. You are NEVER in your room, so go with the basics and you are SO close to the Metro and the Post Office. Be practical and travel like you would live at home! Best money spent this trip! I was also well withing my budget. Which never happens when I come to NY. It was very hot and humid during our visit in August although there are plenty of opportunities to cool down in the many air-conditioned bars, restaurants and shops. We did all the regular tourist attractions - Empire State, Statue of Liberty and Ellis Island, Saks, Tiffany's, Macy's & Bloomingdales, Chrysler Building, Grand Central Station, Minus 5 Ice Bar on the ground floor of the Hilton Hotel, the Metropolitan Museum (check out the roof terrace), Freedom Tower and the 9/11 Memorial (incredibly emotive experience). Enjoyed a very good meal of beautifully cooked fillet minion in Maloney & Porcelli, just around the corner from the hotel. Also enjoyed Ellen's Stardust Diner on Broadway near Times Square. Singing waitresses and waiters make for a great experience. Food portion sizes everywhere are immense, so we mostly had starters for our mains. Central Park is vast and you can walk for hours and hours with lots to see and do. Supper and drinks at Bar 65 on the same floor in the Rockefeller Plaza as the renowned Rainbow Room. Really stunning views of the NY skyline including the Empire State. A hidden gem is to walk the High Line, a disused railway track that has been transformed into an Urban Garden walk. Delightful. Nyc is a phenominal city and the Hudson Hotel is a horrible unestablished ian schrager hotel...go figure because dealing with him you do not get what you pay for. Instead you pay for whatever you get which in any case may be nothing or a different room entirely. We arrived just as the Gay Pride Parade was stepping off on Fifth Avenue near the hotel. What a bonus! Such a positive vibe and the feathers! 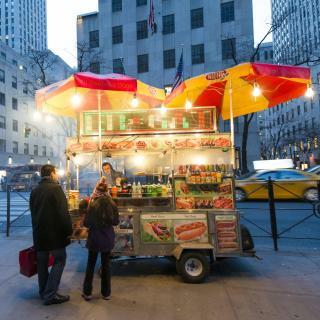 The Bryant Park Hotel is in a perfect mid-town location and right across from the lovely Bryant Park which is behind the 42nd Street Library....the one with the lions on Fifth. This allowed us to take several meals in the park- breakfast and lunches- and people watch, too. The variety of food and drink was excellent. We had tickets to see two musicals which were only blocks away. One day we took the bus up to the Metropolitan Museum of Art on Fifth and 82nd. Easy to get to and the ride back to the hotel on Fifth Ave. was a visual delight. On our last day I went on a hunt for some special items in the Garment District which is only a few blocks away, too. Really, everything is easy to get to from the hotel! The hotel offers a free cocktail hour in the cellar bar each day, which was lovely. All around, we feel that The Bryant Park Hotel was worth every penny. 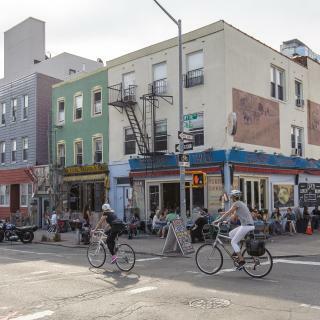 One might find a less expensive place to stay, but not one with a more welcoming atmosphere or in a better location for a NYC atmosphere. The scenery outside our room was amazing of the Empire State Building. When we walked out of our hotel room we headed towards the Statue of Liberty and our journey we came to the 911 ground zero and we seen the new freedom building. I always wanted to see New York and I was given that chance and I hope to visit again soon. and I hope to stay at Hotel Pennsylvania again. It was close to all the food stores and locations we wanted to see. And the location was very close to my Appointment I had to attend. The location and being able to come back to a centrally heated room with all the convenieces of a televison, fridge and hote shower with lots of pressure. A window with a view. I bought an electric kettle and left it for the next guests. The Penn Station is right across the road and you take the LIRR to Jamica and then transfer to the Sky Traın to JFK and ıt takes 20 mins in total..